This thought leadership article looks at how ideas from industries like education, healthcare and retail are helping corporate real estate leaders rejuvenate older building stock across the country. There is an exciting shift currently occurring in corporate buildings across America. Owners, developers and designers are rejuvenating older building stock by rethinking the traditional concept of common spaces. This article looks at how industries like healthcare, education and retail can help corporate real estate leaders be successful in navigating this shift. 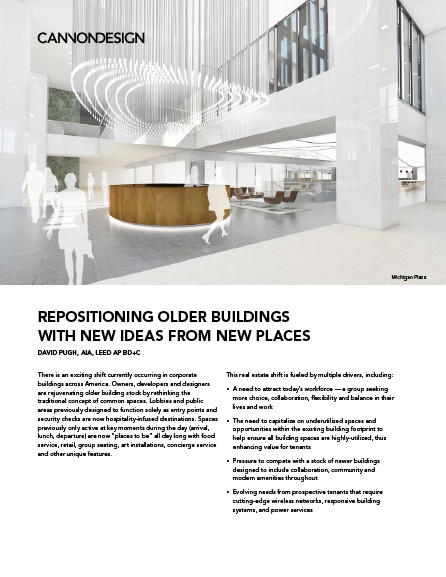 Download this whitepaper to understand new ideas and trends reshaping corporate buildings.